FC Barcelona kicked off their Champions League season with a 4-0 victory over PSV Eindhoven. Lionel Messi scored a hat-trick and Dembélé scored the other goal the Blaugrana had their way with visiting PSV Eindhoven in their opening Champions League group game. The only negative in this game was Umtiti’s sending off for two cautions. Their second group game will be on October 3, 2018, away to Tottenham who lost to Inter 2-1 today. The Camp Nou was the venue for the Blaugrana as they kicked off their 2018-2019 Champions League campaign with an early afternoon kickoff against Dutch champions PSV. It took Barça 31 minutes to break the deadlock when he scored a wonderful free-kick goal to give his side the lead. That would be the lone goal of the half but they would score three more in the second half for an impressive win. in the 75th minute, Dembélé scored the insurance goal in a remarkable manner. After he received the ball, he managed to evade PSV players before gliding to the top of the box before curling an amazing shot in the bottom corner of the PSV goal. Before we could get over that amazing goal, Messi scored his second two minutes later, courtesy of a Rakitic chip, with a close range volley. The Blaugrana were leading 3-0 but moments later, Umtiti was shown red for his second bookable offense and the club had to play the rest of the game with 10 men. Nonetheless, Messi grabbed his hat-trick in the 88th minute, after he scored from a tight angle for his eighth Champions League hat-trick. This hat-trick was his record breaking 8th hat-trick in the history of the competition. 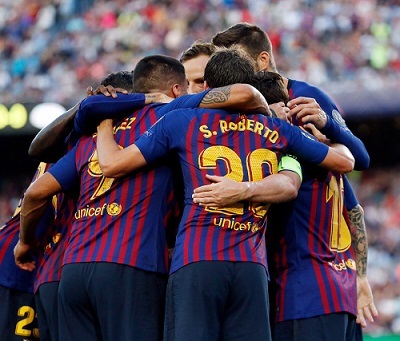 A 4-0 victory meant Barça were Group B leaders and will now have to shift their attention to league action when they host derby rivals, Girona on Sunday. FC BARCELONA: Ter Stegen, Sergi Roberto, Piqué, Umtiti, Jordi Alba, Busquets, Rakitic (Arturo Vidal, 85′), Coutinho (Lenglet, 81′), Messi, Dembélé (Arthur, 83′) & Suárez. PSV: Zoet, Dumfries, Schwaab, Viergever (Isimat-Mirin, 67′), Tasende, Rosario (Erick Gutiérrez, 82′), Hendrix, Pereiro, Bergwijn (Malen, 78′), Lozano & De Jong. Goals: 1-0, Messi (31′); 2-0, Dembélé (75′); 3-0, Messi (77′); 4-0, Messi (88′). Cautions: Umtiti (56′ & 79′ – Red Card); Viergever (29′) & De Jong (77′). Previous PostBarça battle Sociedad to a 2-1 win. Next PostOnce Upon A Time When Barça Wore White.